According to trial live blog by Howard Mintz of the San Jose Mercury News, Apple's attorney Harold McElhinny opened with remarks today outlining the significance of five patents Samsung was found guilty of infringing in the landmark trial last fall. 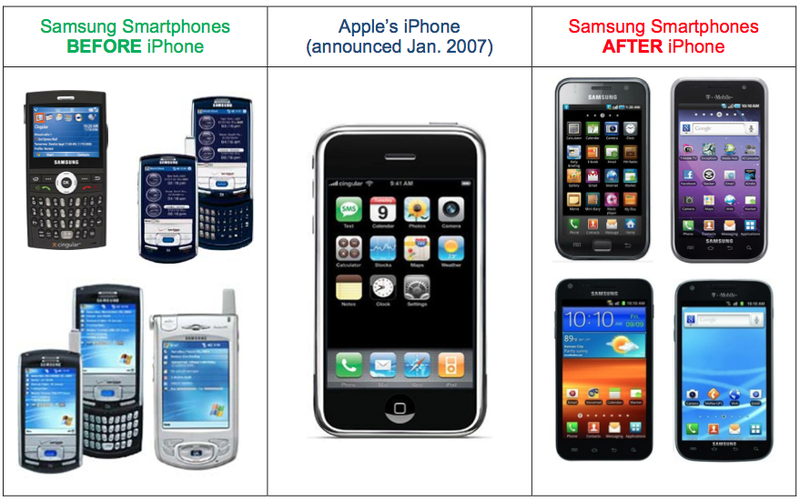 "We are here today not because of how the world reacted to the iPhone, but because of how one competitor, Samsung, reacted," McElhinny stated, contrasting Samsung's "crisis of design" occurring prior to the iPhone to its success after it decided to copy Apple's product. McElhinny's allusion to "Crisis of design" references an internal Samsung memo that surfaced during the original trial despite a series of efforts by Samsung to keep it out of evidence. The memo fretted that in the wake of Apple's then new iPhone, "influential figures outside the company come across the iPhone, and they point out that 'Samsung is dozing off.' All this time we've been paying all our attention to Nokia, and concentrated our efforts on things like Folder, Bar, Slide, yet when our [product] is compared to the unexpected competitor Apple's iPhone, the difference is truly that of Heaven and Earth. It's a crisis of design." McElhinny's opening remarks added, "this trial about a single question: what damages must Samsung pay Apple for violating its intellectual property rights. Samsung sold 10.7 million infringing products. Samsung, the company that broke the law, took in $3.5 billion. You will decide how much of that $3.5 billion will be returned to Apple." Apple is seeking $113 million in lost profits for 360,000 iPhones the company believes it could have sold without competing against its own work, another $231 million in improper profits collected by Samsung on its own sales, and $34 million in patent royalties for the intellectual property Samsung infringed, a total of $379 million. That's a minor decrease from the vacated $400 million originally in play following the trial last fall. The amount approved by the jury in this retrial will be added to the $560 million in damages Apple was awarded in the original trial that is not part of this retrial. "Our star witness is going to be Samsung," McElhinny told the jury. "We are asking you render a verdict that makes Apple whole for the injury Samsung has caused." Representing Samsung, attorney Bill Price countered in his own opening remarks, "Apple is simply asking for much more money than it's entitled to." "This is a case not where we're disputing that the 13 phones contain some elements of Apple's property," Price admitted, adding, "that doesn't mean Apple gets to come in here and ask for a windfall ...for more than it is entitled." Samsung argued that it earned "nowhere close" to $3.5 billion on the infringing devices, instead stating that it earned only $52 million. "And that, he says, is what Apple should get in damages," Mintz reported. Additionally, Samsung proposed paying Apple nothing for lost profits and just $28,000 for patent royalties. Samsung's current offer is a sharp contrast from the company's own demands for roughly $3 billion in annual royalties over a Standard Essential Patent related to iPhones that used a Qualcomm baseband chip that had already licensed all of Samsung's intellectual property. Samsung sought to leverage those controversial damage claims to block Apple's U.S. import shipments via an injunction at the International Trade Commission, a demand that was deemed dangerous enough to invoke a Presidential veto to stop it. Samsung's countersuit at the original 2012 trial also sought $290 to $399 million in damages related to other Standard Essential Patents owned by the company. Samsung lost its countersuit after failing to prove Apple infringed any of those patents. Apple had originally sought around $2.5 billion in damages in its initial patent trial against Samsung, while Samsung hoped to pay $519 million. A jury awarded Apple $1.05 billion, $400 million of which was later subjected to retrial in the current hearing, which began with a jury selection yesterday. The two companies are also gearing up for a second patent trial that will begin next spring, involving a second volley of Apple's iPhone patents against Samsung phones that, by the time the trial begins, will not have been off the market for nearly two years.